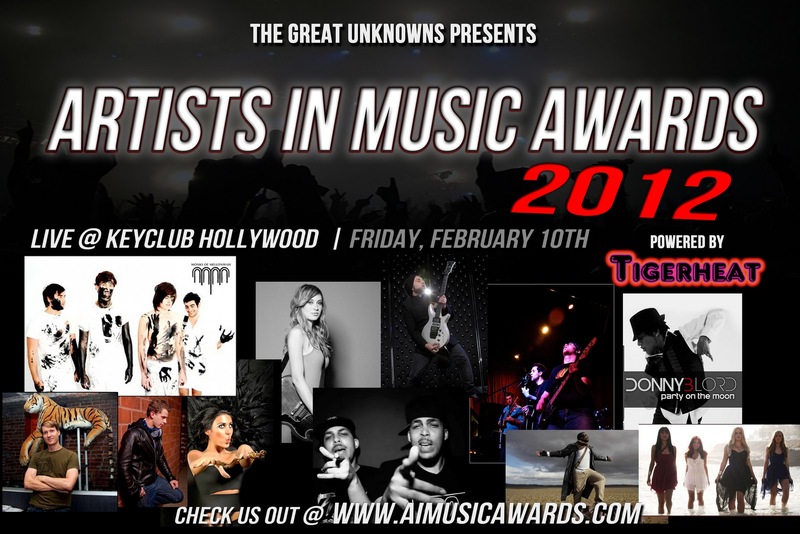 We're just seven days until the inaugural premiere of the Artists In Music Awards coming to Key Club in Hollywood, CA on Feb 10, 2012. In this final episode of the Nominee Showcase, we will visit music by the nine performers you will see live on stage at the award ceremony. Donny B. Lord "Party on the Moon"
Katie Cole "Lost Inside a Moment"
Monte Pittman "Pain, Love, & Destiny" compilation. I called down to the Key Club, and they gave me your email only. I need to get four names on the VIP ilst for the red carpet ceremony Friday before the awards show, schedule, too. I have a nominee of two categories, and she has not heard from anyone at 2012 Artists in Music Awards as for Red Carpet details,so can you please call me 818 340 5300 or cell 818 6189 9229.